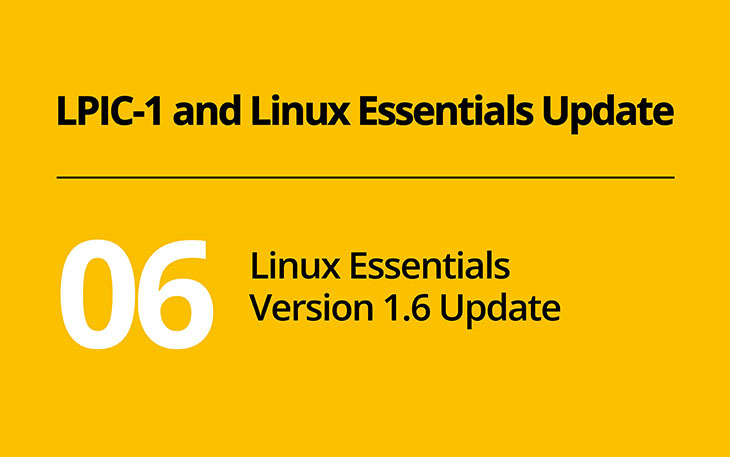 Besides LPIC-1, the Linux Essential certificate received an update in October 2018, too. It is a minor update which brings the certificate from version 1.5 to version 1.6 and only includes a few changes. In today’s post we take a look at what’s new. The exam objective 1.1 covers knowledge about the Linux ecosystem. It already mentions several Linux distributions. In the updated exam, SUSE and Raspbian were added. SUSE is a vendor of SUSE Enterprise Linux, and also offers the free openSUSE distribution. Check out openSUSE on wikipedia to learn more about them. Raspbian is a Debian GNU/Linux derivative which runs on the Raspberry Pi, which also became relevant for objectives 1.1. You’ve most certainly already heard about the Raspberry Pi, which is a super small cheap computer which serves as an excellent tool for experiments and the development of prototypes. If you’re not familiar with the Raspberry Pi yet, watch ‘What is a Raspberry Pi’ on YouTube. The Raspberry Pi is a great example how Linux runs on numerous devices. The opposite to the small single-board computer are big data centers, today often called ‘clouds’. Here, Linux plays an important role. If you take a look at the big cloud vendors’ offerings for Infrastructure as a Service (IaaS), they all sell so-called ‘instances’, which are basically virtual machines. When creating a new instance, you can choose between multiple images which contain ready to run Linux distributions, so you can start using your instance right away, without any additional installation. Objective 1.2 tests knowledge about major open source applications. Here, we added Nextcloud and ownCloud. As Nextcloud is a fork of ownCloud, both projects still have a lot of similarities. In their core, both provide the ability to upload, download and share files. In addition, so-called ‘Apps’ can be installed to add functionality such as contact management, a calendar, todo lists and even kanban boards and an RSS feed reader. Both tools provide a web interface as well as integration for mobile devices. Of course you could get these services from some big cloud providers for free, but with Nextcloud and ownCloud, you can host these services on your own, without ads, with the knowledge of where your data is stored -- and with the fun of running your cloud services on your own! Similarly, objectives 1.3, which covers open source licenses, was extended with the terms ‘Copyleft’ and ‘Permissive’. Again, there is a lot to know about these terms, but Linux Essentials is about the basic idea. Both terms relate to what you can do with software under a free software license. Most licenses fall into one of these categories. The major difference is that copyleft licenses, such as the GPL, tries to keep all changes to the software under that specific license. Therefore, whenever a GPL program is shared with someone else, its source code, including all modifications, must be shared as well. Permissive licenses, on the other hand, are very liberal and allow using the software in any way you like, even if it is in proprietary software. Details of Free software licenses are complicated, but, once again, focus on the general idea. Finally, we made two small cleanups: the term 'Open Source Philosophy' was moved from objective 1.1 to 1.3, and, in objective 3.3, we made it explicit that by ‘Awareness of common text editors' we refer to vi and nano. As you see, the vast majority of the exam was not changed. This means that study materials for version 1.5 are still mostly valid; just make sure you also collect some information on the topics mentioned in this post. As always, make sure to work with the exam objectives to make sure you focus on the specific tasks LPI asks you to know. If you’re taking the Linux Essentials exam soon, good luck.